Local 700 Trustee Greg Ortiz spoke at the Nov. 10 General Membership Meeting about the importance of remembering our veterans. 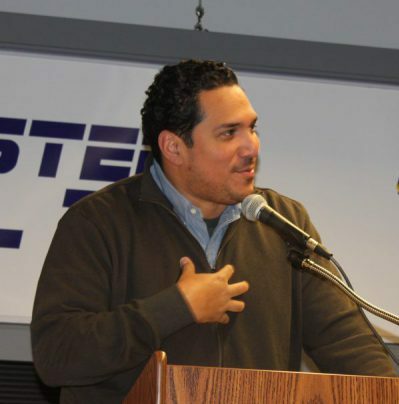 Teamsters Local 700 Executive Board Trustee Greg Ortiz was recently appointed Chairman of the union’s Political Action Committee. A Teamster since 1998, he has previously served Local 700 as union steward, elected delegate and business agent. Greg’s work experience with the City of Chicago spans across four departments including: Department of Aviation, Transportation, Streets and Sanitation and Water Management. “As a rank-and-file member of the City of Chicago Department of Water Management, Greg has both the knowledge and experience to determine what issues are important to the membership and to make sure we are supporting the right candidates,” said Becky Strzechowski, Teamsters Local 700 President. In addition to his service to the city and to the union, Greg is a veteran of the United States Army. He served in two deployments overseas in the Global War on Terrorism as a U.S. Army Infantryman. He retired from the position of First Sergeant in 2011, having earned the Combat Infantryman Badge, the Bronze Star and the Army Accommodation Medal for Valor in battle. Greg serves as the military liaison for Local 700 and the Teamsters Military Assistance Program (TMAP).